A near-perfect blend of retro looks and modern technology, the Gretsch Electromatic Jet BT, with wide-spectrum Black Top Broad'Tron pickups and chambered mahogany body, takes you across the full spectrum of guitar tone, from crystal-clean to as much grind as you could want. Sporting a streamlined "V" stoptail and Silver plexi pickguard, the Electromatic Jet BT also gets major points for onstage style. 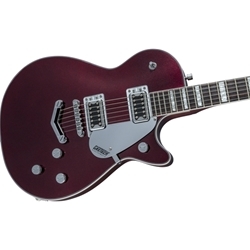 The G5220 Electromatic Jet electric guitar represents classic Gretsch tone by not shying away from a chambered mahogany body. It may not be the lightest tonewood around, but it is one of the truly classic woods known for its rich, deep tone. A time-tested maple top also adds to the vintage tone of this guitar. The all-mahogany neck with black walnut fingerboard is the proverbial icing on the cake as this combination is known for its delicious tone.